Khaled al-Asaad, the archaeologist who has reportedly been killed by Islamic State militants, had a lifelong connection to the town, having been born into a prominent family in the area in 1934. Although curating the ruins at the Unesco World Heritage site would become his life's work and he had a degree in history from Damascus University, he had no formal training in archaeology - all his knowledge in this field was self-taught. Archaeologist and former Syrian antiquities official Amr al-Azm, who knew Mr Asaad, told the BBC that he was an "icon of Palmyrene archaeology". "If you needed to do anything in Palmyra with regards to the archaeology or the monuments, you had to go through Khaled al-Asaad. He was essentially 'Mr Palmyra'," Mr Azm said. Mr Asaad was involved in the early excavation and restoration work at the site, and carried on this work for four decades. "When you look at Palmyra today as an archaeological site, really that's the legacy of Khaled al-Asaad," Mr Azm says. "We lost this great... resource of knowledge on Palmyra and its history, much acquired through personal, direct contact... the sort of information you could never get from a book or a lecture," he added. One of the "crimes" IS apparently accused Mr Asaad of was working with the regime of President Bashar al-Assad. He was a member of the ruling Baath Party but there is no clear evidence that he was an active supporter of the regime - anyone in any position of authority in Syria during this time had to be a party member. When he retired in 2003, his son Walid took on the mantle of his work at the site - both were reportedly detained by IS last month. Syrian antiquities chief Maamoun Abdulkarim told AFP that Mr Asaad's other son Mohammed and his son-in-law Khalil actively participated in the rescue of 400 antiquities as the town was being taken over by the jihadists in May. 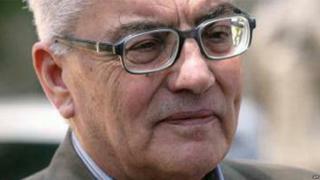 Mr Abdul Karim said IS militants had tried to extract information from Mr Assad about where some treasures were hidden. Some reports say that he was executed after refusing these requests. Historian and writer Tom Holland said if the reports were true, Mr Asaad was "not just a martyr, but a hero. "Islamic State is very keen on the idea of martyrdom, but if this is true, it shows that it is not only religiously inspired interpretations of the past that people feel are worth dying for."